BRUSSELS, 22 January 2018 - COSCO SHIPPING Ports Limited ( "COSCO SHIPPING Ports" or "CSP" or "the Company"; SEHK：1199), the world's leading port operator, announced a signing ceremony was held today with Port of Zeebrugge in Brussels of Belgium for the concession terms of CSP Zeebrugge Terminal ("CSP Zeebrugge"). The event also witnessed the signing of a Memorandum of Understanding ("MoU") between the Company and CMA CGM Group ("CMA"), the Marseille based world's leading shipping company and member of Ocean Alliance, for CMA's initial investment of 10% in CSP Zeebrugge. The event was presided over by H.E. Kris Peeters, Vice Prime Minister and Minister for Work, Economic Affairs and Consumer Affairs, responsible for Foreign Trade, H.E. Qu Xing, Ambassador Extraordinary and Plenipotentiary of the People's Republic of China to the Kingdom of Belgium, Mr. Guo Jianjun, Economic and Commercial Counselor, Embassy of The People's Republic of China to Kingdom of Belgium, Mr. Carl Decaluwé, Governor, Province of West Flanders, Belgium, Mr. Renaat Landuyt, Chairman of the Board of Port of Zeebrugge and Mayor of the City of Bruges, Mr. Joachim Coens, Managing Director of Port of Zeebrugge, Mr. Vincent De Saedeleer, Hon. Vice president of Port of Zeebrugge, Mr. Farid T. Salem, Executive Director of CMA, Capt. Xu Lirong, Chairman of China COSCO SHIPPING Corporation Limited ("COSCO SHIPPING" or "the Group"), Mr. Wang Haimin, Managing Director of COSCO SHIPPING Lines Co. Ltd., and Mr. Zhang Wei, Vice Chairman and Managing Director of COSCO SHIPPING Ports. The signing ceremony for the concession terms of the CSP Zeebrugge Terminal between CSP and Port of Zeebrugge was signed by Mr. Zhang Wei and Mr. Renaat Landuyt, with other officiating guests and company management on the stage witnessing the signing and delivery of speeches. The MoU between CSP and CMA was signed by Mr. Zhang Wei and Mr. Farid T. Salem. H.E. Kris Peeters, Vice Prime Minister and Minister for Work, Economic Affairs and Consumer Affairs, responsible for Foreign Trade, said, "COSCO SHIPPING's decision once again proves that, with its open economy and central position in Europe, Belgium is the ideal place for logistic investments. During the first nine months of 2017, our exports to China increased by 20 percent, reaching 6 billion Euro. China is getting more significant as a trading partner. Last year's opening of a direct train connection between the port and the city of Daqing in China already testified to this fact. 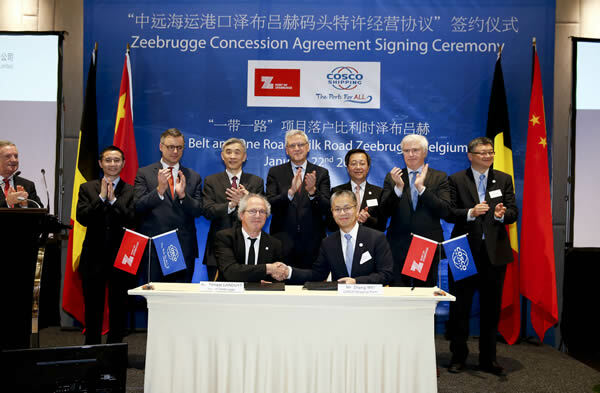 The continued presence of COSCO SHIPPING in Zeebrugge contributes to strengthening Belgian-Chinese trade and the international position of the Port of Zeebrugge." Speaking at the signing ceremony, H.E. Qu Xing, Ambassador Extraordinary and Plenipotentiary of the People's Republic of China to the Kingdom of Belgium said, "The launch of Belt and Road initiative between China and Belgium in 2014 has laid a solid foundation for today's signing ceremony. Port of Zeebrugge is farsighted in partnering with China; it's a pioneer by making a series of decisive moves and has achieved noticeable results. China-Belgium trade is bilateral, not unilateral. The cooperation between China and Belgium is win-win. 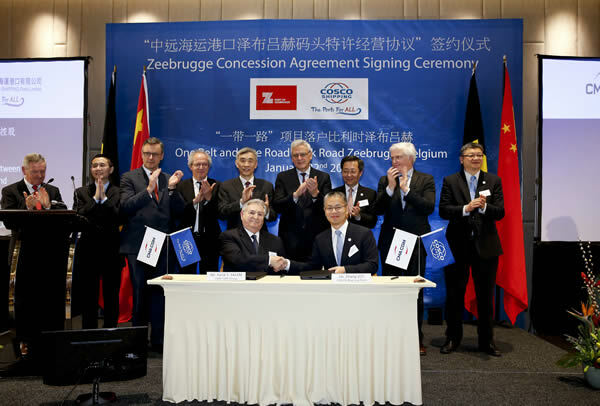 By actively exploring cooperation opportunities with China, Zeebrugge port has gained importance in international sea freight market, especially Northwest European routes. Looking forward to 2018, we are very confident in the relations and trade cooperation between China and Belgium as today's signing ceremony set a precedent. Let us work together to drive the win-win cooperation between the two countries to the next stage." Capt. Xu Lirong, Chairman of COSCO SHIPPING expressed his views that, "Being the major gateway port of Belgium and major hub port in Northwest Europe, Zeebrugge port plays an important role in sea transportation. The signing of concession terms with Port of Zeebrugge will further enhance the terminal services and deepen the bilateral trade relationships between the two countries; furthermore, we are discussing with Port of Zeebrugge about our cooperation of developing full logistics services on the terminal hinterland, I hope we will have developments soon to enhance the customer services. After the signing of concession terms with Port of Zeebrugge, CSP will take the control of CSP Zeebrugge Terminal and develop it into a gateway port of COSCO SHIPPING in Northwest Europe." Mr. Zhang Wei, Vice Chairman and Managing Director of COSCO SHIPPING Ports indicated that "Today we are proud to announce that CSP Zeebrugge is now in our portfolio. There are many reasons why we choose Zeebrugge as our first gateway port in Northwest Europe. With its prime location and water depth, it provides ideal conditions for mega vessels. We plan not only to develop CSP Zeebrugge into a maritime crossroads but also an ultra-logistics platform to serve continental Europe and the British Isles. With this plan, we will work closely with the Port of Zeebrugge on the Maritime Logistic Zone. Furthermore, we are delighted to have CMA as our partner. With the cooperation of CMA, we are confident that we not only can deliver high quality services but also capture the economic opportunities emerging around the Port of Zeebrugge." Mr. Joachim Coens, Managing Director of Port of Zeebrugge said, "Zeebrugge port provides favourable coastal conditions to accommodate mega-vessels. Located in the outer port with strong infrastructure, CSP Zeebrugge is well equipped to provide efficient services to shipping companies; the staff of it are keen to embrace a new chapter of development. Moreover, one of our key strategies is to reach out to other markets and develop hinterland logistics; we will focus on these opportunities and develop a comprehensive intermodal network." Mr. Farid T. Salem, Executive Director of CMA, said, "Today is a great day for COSCO SHIPPING Ports, CMA, Port of Zeebrugge and for all of you as we are assembled for signing the concession agreement and MoU of investment in Zeebrugge Terminal. As one among the leaders in the shipping industry, we are enthusiastic to be part of Zeebrugge Terminal's future at the invitation of our strategic partner COSCO SHIPPING Ports. The Terminal will be part of our global strategy and we are pleased to become a partner of COSCO SHIPPING Ports in this Terminal, and to contribute to its success." As the second largest port in Belgium, the Zeebrugge port enjoys favourable geographical position. CSP Zeebrugge is close to Hamburg and Le Havre and is within a short distance of Great Britain. Being a transportation hub for traffic in all directions, CSP Zeebrugge has a good network of road and rail connections to all countries of Continental Europe, and to other ports in Northwest, Central and Eastern Europe. In addition, Zeebrugge port is a natural deep-water harbour and is capable of satisfying the needs of mega-vessels. CSP Zeebrugge is the first terminal in Northwest Europe in which the Company holds a controlling stake and will facilitate the Company in establishing its major hub ports and global strategic focal point.